So I finally got all the parts together. 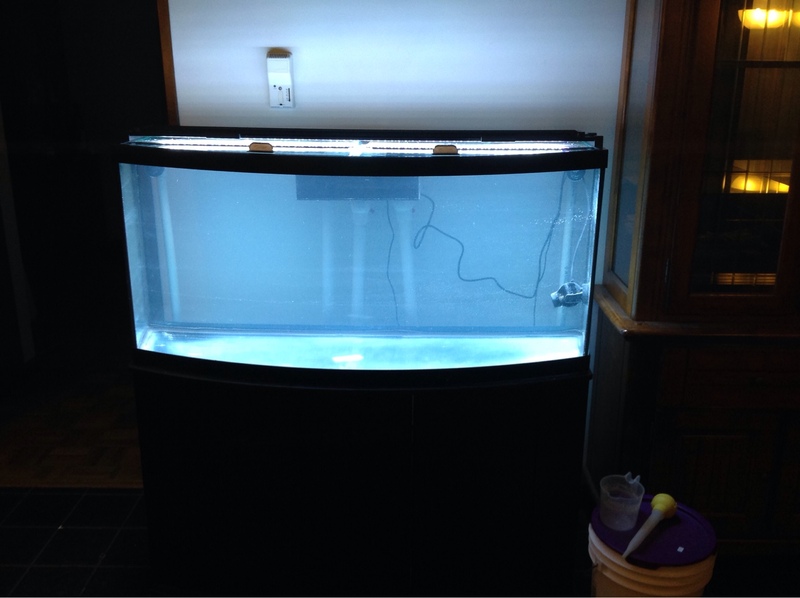 I bought the bowfront on a whim last summer for 40 bucks stand and tank! I replaced the broken cross bar with clear acrylic panel, water tested. Built my sump from a 20 gallon long. Now I drill! Plumbing next then water test. Did you just epoxy the brace in? If so consider adding an acrylic screw to each side. Cilyjr, there are 4 nylon screws on each side. I tried the epoxy by it self and it popped off when I filled the tank and water tested. With the screws it held 5 days with water before I drained it. Update- just finished cutting the plumbing, now I need to glue it together and still the air valve for the trickle drain. Update** I have finished pluming glueing and ran into a problem. 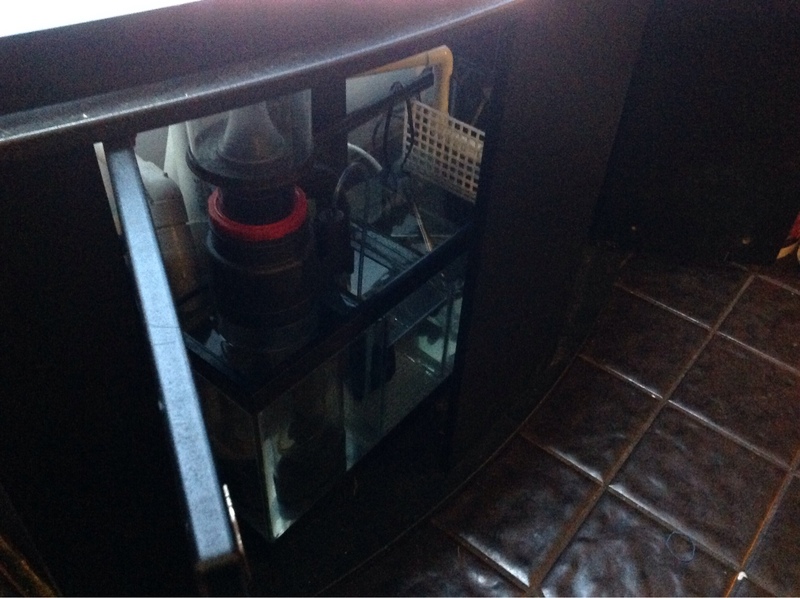 The siphon didn't start because I had the pipe too far into the sump and it couldn't clear the air in the pipe. Cut and resized the bottoms and now it runs... SILENTLY!!!! Thank you John for recommending to drill the extra hole! Salt water is in and I am picking up live rock tomorrow and going to ghost feed to cycle. Currently have a jeabo pump, a 300 watt heater as a back up set at 74 and a 250 watt heater set at 76. Lighting is a fluval reef and marine full spectrum light. I am thinking about ordering this sand because I love the color. Kinda dark, my iPad does not have a flash. nice set up! keep post more photo and tank progress. what kind of fishes and corals you have in mind? Looking good. That skimmer looks massive! Not sure of fish. I am partial to softies and LPS. I would like to get some sps like birdsnest and caps, we'll see once I start buying! I got live rock from Michelle over the weekend, and just finished aqua scaping. I like the set up, I only wanted one rock in the middle (the red one with the hole it in) but could not resist the other arched rock. I did order the indo-pacific sand from dr foster and smith. Got free shipping and they had a 20% off coupon on a single item and got each bag down to 18 and change. I have 60 pounds coming in of that. I turned on the skimmer to see how it runs with the system and found it is a bit noisy. I am thinking of replacing the pump to a quiet flow koralia or something along those lines. If that doesn't work I will give it away to someone who has a basement sump who doesn't mind a little noise. System has been running for about a week with water in it, everything tested 0 ammonia, nitrates, and nitrites. I over ghost fed the tank with a big scoop of food and will be testing again. Is it a coral life superskimmer? If so consider replacing it for performance issues in addition to noise. Someone is always selling a decent used Skimmer on the cheap here. I got the black and white info-pacific sand in last week and it looks amazing! Still no ammonia nitrates and nitrites but I do have a brown algea bloom which I expected at some point. I did end up breaking the center brace that I previously fixed so I went ahead and bought a 2' clam brought the glass back together and re-attached the main brace as well as 2 more support braces as seen below. Still ghost feeding but seeing nothing on the tests. It broke? How thick was the acrylic for the 1st brace? Thanks jah-hoeva, cilyjr the acrylic didn't break the actual plastic on the frame broke off. The replacement acrylic is about 1/4" thick (I think) but when I picked up the glass lid it caused added pressure in the center and the frame broke off. So a fresh coat of gorilla glue and the clamp fixed the main brace, new pieces added and nylon screws and two more braces to help support the pressure. I see. I left an extra inch when I cut the brace to have extra hold. 3/8 is strong enough so 1/4 inch will do the trick. I got the tank and stand for $40 because the center brace said broken. They suggested to use it as a terrarium only. The way it was broken it had no connection to the back at all that is why I made it so thick because it had to stretch 7 inches to be able to bolt it to the frame. Unfortunately the frame broke behind the nylons screws so when I re-glued it I added the other two braces on non-damaged from to support it in case of future breaks. Pretty soon if it breaks again I will just have the whole thing covered in plexi just to brace the thing!